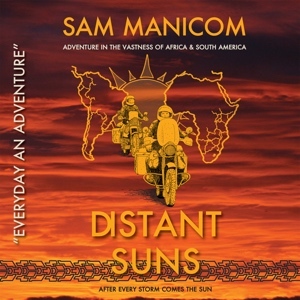 The riveting story of Sam and Birgit’s three-year adventure through Southern Africa and South & Central America is now available as an Audio Book. Sam Manicom’s dynamic third book transports you through three very different parts of the world. Sam is now travelling with a companion, Birgit, who you’ll have met during the course of his previous audiobook ‘Under Asian Skies’. In part, Distant Suns is the story of how boy meets girl, both endowed with a mile-wide streak of wanderlust, and both fiercely independent, but learning to live together on the road, and saving each other’s lives on occasion. Birgit catches your attention right away with her incredible initiative and capability with her bike. Yet she’d only been riding a bike for 600 miles when they arrived in Kenya at the beginning of this journey. Sam and Birgit’s adventures are seldom without risk, but the attitude they have is hugely positive and that turns even the direst of times into a new and enthralling aspect of the road. When Paul Theroux wrote, ‘Take the leap. Go as far as you can. Try staying out of touch. Become a stranger in a strange land’, he could have been describing Distant Suns. Sam’s acute observations of the human behaviour, drama, passion, disaster, and the humour of three very different parts of the world may well surprise you. Motorcycle Explorer Magazine ‘Sam delivers his travels in a personal way that connects you to his adventures as if you’re a long standing friend listening to him chat at the bar. The book flows beautifully and with such little effort required from the reader that you find yourself in the cliché ‘couldn’t put it down’.